IBM® continues to enhance the functionality, performance, availability, and ease of use of IBM DB2® utilities. This IBM Redbooks® publication is the result of a project dedicated to the current DB2 Version 9 Utilities Suite product. It provides information about introducing the functions that help set up and invoke the utilities in operational scenarios, shows how to optimize concurrent execution of utilities and collect information for triggering utilities execution, and provides considerations about partitioning. It also describes the new functions provided by several utilities for SHARE LEVEL CHANGE execution, which maximize availability and the exploitation of DFSMS constructs by the BACKUP and RESTORE SYSTEM utilities. 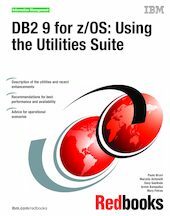 This book concentrates on the enhancements provided by DB2 UDB for z/OS Version 8 and DB2 for z/OS Version 9. It implicitly assumes a basic level of familiarity with the utilities provided by DB2 for z/OS and OS/390® Version 7.